Dr Julia Sevi’s distinctive fusion of aesthetic and holistic medicine works in harmony with your body, stimulating health and repair. A perfectionist, with a passion for patient care, safety and attention to detail, she judiciously prescribes aesthetic treatments with an artistic eye, often in combination with integrated medical care to achieve the most natural looking, long lasting and healthy results. For the last 20 years, her private medical practice has integrated Western and Complementary medicine, believing that the best of both worlds is best for health. Having qualified as a doctor in 1991 from Leeds Medical School, she worked in NHS Teaching Hospitals and subsequently in General Practice for 10 years, developing a particular interest in skin. In tandem with her western medical career she maintained a holistic private practice, spent time travelling and working abroad, investigating the medicine of different cultures, choosing to study Acupuncture and Chinese Medicine in the University of Beijing. In 1993 she co-founded the Good Health Centre with her husband, an established centre of excellence combining Western and Complementary Medicine, where she practised Integrated Medicine with emphasis on anti-ageing, longevity and skin health. She developed Aesthetic Health in 2008 to create a discreet, specialised environment from which to provide aesthetic and anti-ageing medical care. Together the sister clinics offer a harmonious mix of treatments for complete health. Continually striving to offer the best to her patients, Dr Julia attends numerous international conferences to bring home the most scientifically effective treatments. Her particular areas of interest are natural regenerative treatments, scar tissue and research into tissue regeneration. In 2012 she established FaceForward, a charity to provide and research treatment of scars. Great service and advice is freely given and options carefully considered by the knowledgeable and friendly staff. Great, friendly place with practitioners who really know their stuff. All the staff are really lovely. The girls on the desk always make sure I’m looked after well with drinks and snacks! I have been treated by a few different people here and I completely trust them all. 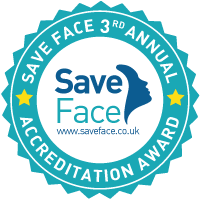 I really feel like they work hard to give me the best treatment to suit my skin, adapting treatment when necessary to get the best results. I wouldn’t go anywhere else! From the minute you step into the clinic you are made to feel welcome and relaxed. ALL of the team are professional, personable and caring, and I can highly recommend the treatments that are offered!